Fall is coming and the leaves are coming down in full color and splendor! Everyone is out and looking for that hidden gem in a major city. In Vienna, locals not joining the crowds at Stefansplatz will be looking for somewhere calmer, but still lively; fun but manageable. From where I am sitting, there is no better place in the fall months when the weather holds than Sobieskiplatz in the 9th. This small square, tucked in between Währingerstrasse and Nussdorferstrasse, gets virtually no notice on any travel guide or even local flyer. Yet between the two bars and the picturesque cobblestones, there are few urban hideaways like it. The ample seating room and bubbling fountain would be appropriate on any café postcard. 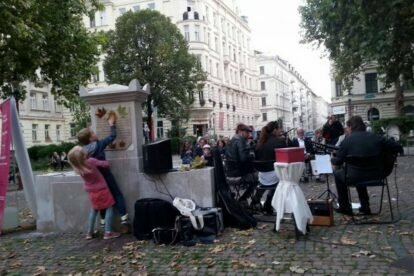 On weekends in summer, live music wafts through the crisp autumn air and local chatter hums a very Viennese tune. The two bars are splendid and deserve their own reviews. The Highlander is a gastropub and microbrewery with perhaps the finest Märzen the city has to offer. Cafe Greisslerei Vinothek sits on the opposite corner and has a superb hide-a-way feel behind some leafy hedges. There are numerous places in Vienna where one can stop for a drink, a rest, and a conversation, but you will find me at Sobieskitplatz with a large Märzen in hand.